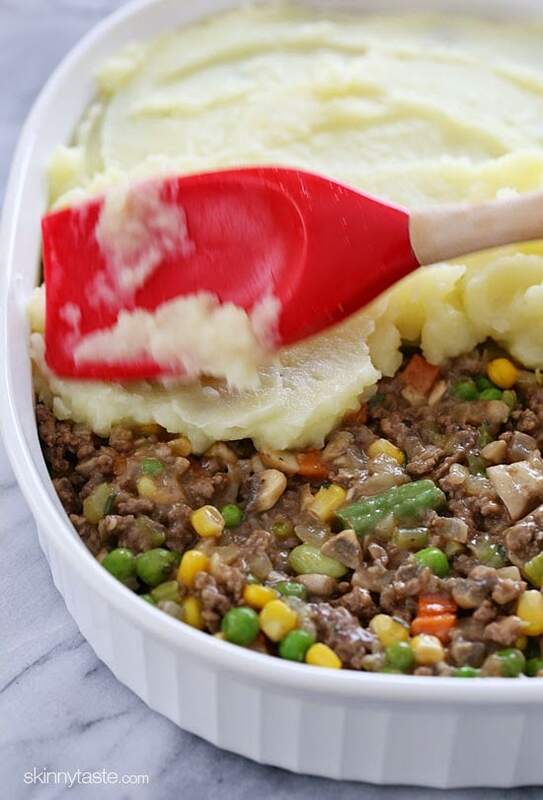 This lightened up Shepherd’s Pie recipe, filled with lean ground beef, veggies, and topped with yukon gold mashed potatoes would be perfect for all you meat and potato lovers out there! 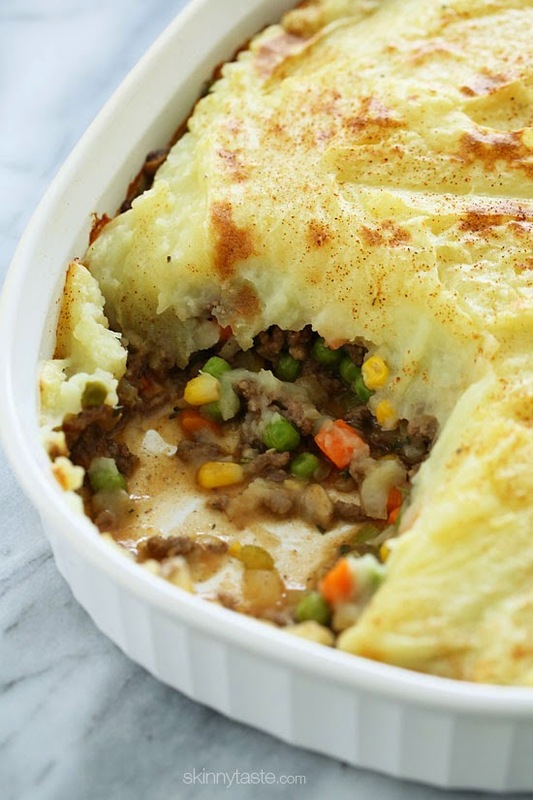 Shepherd’s pie, a meat pie topped with mashed potato is traditionally made with lamb, when made with ground beef it’s actually called a cottage pie. Of course, you can make this with ground turkey like this Turkey Sweet Potato Shepherd’s Pie or try my vegetarian Portobello Shepherd’s Pie. To Make Ahead: This is a great dish to prep and make ahead a few days in advance. Assemble and cover with foil. Refrigerate up to 2 days ahead, then bake in a preheated oven 400F about 30 minutes, or until heated through. Leftovers: Store cooled leftovers in an airtight container in the refrigerator for up to 3 days. To freeze, transfer to a freezer safe containers for up to 1 month. Swap the beef for lamb, ground turkey or for a vegetarian version try this Portobello Shepherd’s Pie. If you want to keep the carbs low, top it with cauliflower mash instead. Leftovers freeze well and can be reheated later. Drain and mash with chicken broth, sour cream, 1/2 tsp salt and pepper, set aside. In a large saute pan brown meat over medium high heat, breaking the meat up with a wooden spoon as it cooks. Season with 1/2 tsp salt and pepper to taste. Add the oil, onion, garlic, mushrooms and celery and sauté on medium heat about 6 to 8 minutes, until the vegetables are tender. Add the flour, frozen vegetables, beef broth, tomato paste, Worcestershire sauce, rosemary, thyme, cooked meat and mix well. Simmer on low about 8-10 minutes. Remove from oven and let it cool 5 minutes before serving. This is comfort food at it’s finest! I know my family is going to love this. This looks delicious! I’d like to make this and put it in the feeeser until I’m ready to bake it. Maybe a weeks tops. Would I still put the potatoes on top or add that last? Do I need to thaw it first? Delicious? My only criticism is that this recipe takes WAAAAAY longer than 10 minutes to prep, It took me longer than that to just peel and cut the potatoes and chop the other vegetables. Not sure what I did wrong but it was very juicy. Any ideas? Just put it in the oven. Cant wait to try, QUESTION: the prep time on the recites I’ve tried here seems to be quite different from the reality. For example, this recipe took prob an hour and 10 minutes. Has anyone cooked this from frozen? Would you recommend thawing it first? Covered or uncovered? Time and temperature? Any advice is helpful! This recipe was delicious. My French Canadian mother used to make it with just 3 ingredients and I still love it to this day. She browned her lean beef with garlic and onions (to taste), then put hat in that first layer, then came either of plain canned or frozen corn or a can of creamed corn, and lastly a layer of mashed potatoes, with lots of butter, salt and pepper (scant). Bake at 350 for 30 minutes. Serve as is, or with catsup or gravy. Delicious cottage pie! !Very yummy and easy. I like that it can be prepared ahead. The name is incorrect. 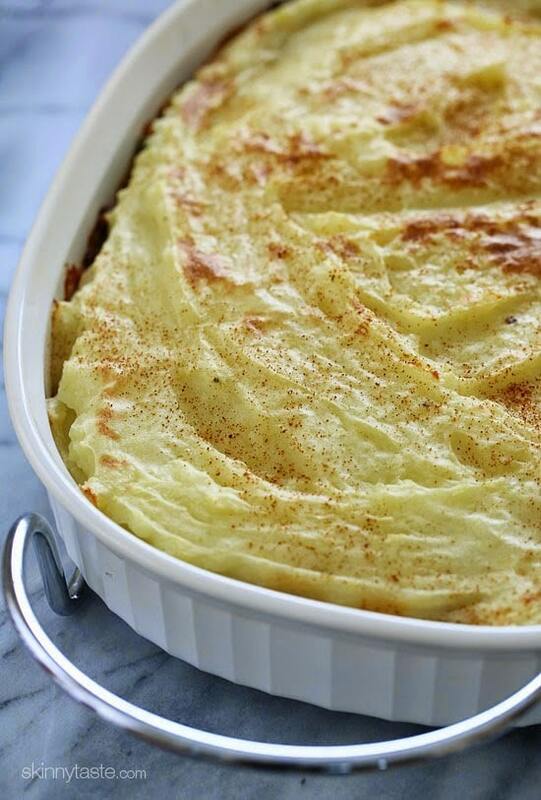 Shepherd’s pie is made with lamb. Any other meat and it is Cottage Pie. Can you please advise what size casserole dish you used. Several people have asked and I am curious as well. I ended up just spreading the potatoes on top of my meat mixture in the pan and putting it in the oven. One less dish to clean is always a plus. This was delicious! I’ve made it several times now. It’s a keeper! I also wonder how this is 5 points. Any way I put it into my calculator it is 7. I notice this with quite a few recipes. Am I doing something wrong? Hi Mary. The only accurate way to determine any recipe’s SmartPoints® value is to plug the ingredients into the recipe builder on the Weight Watchers website (Click on “My Foods,” select “Recipe,” and click “Create a recipe.”) which does not count fruits and vegetables in recipes in the calculations as they are now 0 points. I am so excited to find this recipe — this is my husband’s favorite and he always wants me to buy it at Costco where it is a nutritional nightmare! One question … I am using ground turkey (93% lean) so I put everything into the recipe builder to see if it changed the points. Even though a pound of 93% lean ground turkey is one point less than a pound of 95% lean ground beef, the recipe builder gave me a points value of 6 points. Still a “good deal” in terms of points, but I’m confused as to how you got 5 points using the recipe builder. Thanks! Omg ! Just delious , I used ground turkey so perhaps a bit less than 5 sp . This is absolutely delicious! It was perfect for a snow day—warm, comforting, and tasty! I substituted ground turkey for beef, and chicken broth instead of beef broth. I will definitely be making this again! 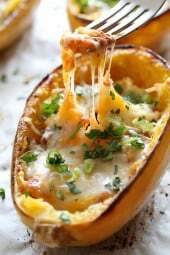 I want to make this tomorrow for a potluck Has anyone used sweet potatoes with this? I made this tonight and it might be my favorite recipe on your site (and I’ve made many of them). Perfect winter dinner. This recipe is FANTASTIC, and simple to make. I made it with ground turkey instead of beef (simply what I had on hand), and it was delicious (and husband approved!). The leftovers almost tasted better than when it came out of the oven. I will certainly be making this one again! Absolute family favorite! Perfect meal on a cooler evening. Wonderful flavors. Have you tried sweet potatoes with this before? This looks really good and I’m going to make it. What size casserole dish is needed? Is it a 9″ x 13″? I had the same question. I don’t see a size anywhere and the dish I chose was too big. 2nd time making this and it was great again. I halved the recipe and it’s perfect for two people plus some. Can I make this as a freezer meal? I am making a bunch of freezer meals as I am pregnant and want to have meals prepared for when baby arrives. How do I modify this to make it freezer ready? Anyone want to suggest other freezer meal recipes that are healthy that would be highly appreciated. Does anyone know how many points this would be on the “old” Smart Points? (Pre-Freestyle). I think the only different would be the lima beans and corn being points. Maybe 6? Absolutely delicious. Will definitely make it again! Very good. And easy. Delicious, will make it again. This is so delicious. It’s also very point friendly. I made it with ground turkey ?. This should be called cottage pie as it is made with beef and not lamb hence the name shepherds pie. I used the recipe builder and this cake to 6 Freestyle points. what gives? pretty sure she meant “came….not cake. I doubled this recipe for a family dinner last night and am pleased to report, 2nds AND 3rd were had by all! This is a keeper! The only subs I made were vegan sour cream for my dairy free MIL, and fresh green beans and carrots for the frozen. Thanks Gina!! Really good! I upped the seasonings a bit and did 1lb Yukon and 1 Head cauliflower for the top (boiled it all together and mashed it together with the method noted in the recipe). So delicous! Thanks for all the great recipes! The potatoes in this dish are magical. So happy to have this lightened up version to serve on St. Patty’s Day! A little more time intensive, but, I made 1.5 x and it will freeze well. Thank you so much for this recipe! We made it for dinner earlier this week, and it is, hands down, the best Shepherd’s Pie I’ve ever had. It gets even better overnight in the fridge as the seasonings blend a bit. Just FYI, Shepherds pie is made with lamb (hence the name), it’s called Cottage Pie if you make it with beef. Interesting.. 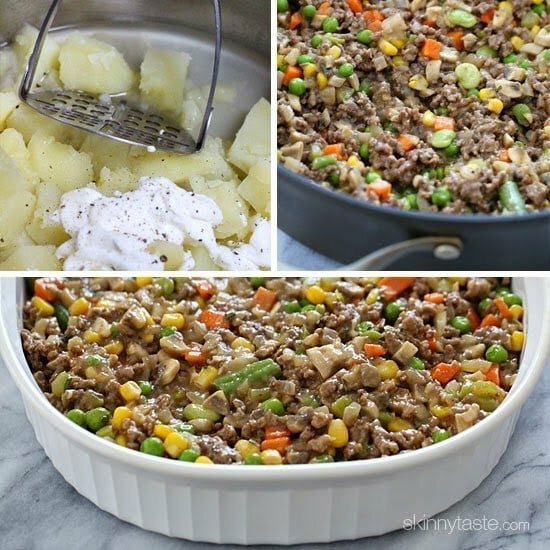 I have never seen a Shepherd’s Pie that was made with lamb – only beef! And I’d never even heard of a Cottage Pie. We make both in the UK/Australia but the names are important since shepherd’s herd sheep, not cows! I think they use lamb, for the Shepard pie, cause, it being that shepards have lambs. I wouldn’t want to eat my lambs. I would use th beef. and call what you want. Just my thought. This tasted amazing. My husband and I really enjoyed making it together. only complaint is you dont list the size casserole dish to use! I used ground 97% turkey (instead of beef) and mashed cauliflower (instead of potatoes). I also used the whole can of beef broth. Delicious. I’m getting 6 points per serving, but that’s for 6 servings – and I think that this really could serve 7-8. Another fabulous Skinnytaste recipe! Do not know how many times I have made this without reviewing. I usually make this in 2 smaller casseroles and freeze one for later. 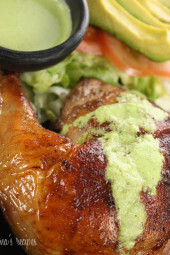 It is easy to put together and tastes so yummy. Tonight the whole casserole is going to a potluck. Thanks for another great recipe. Can you use ground turkey? I’m not a huge beef fan. How much would that change the nutrition? 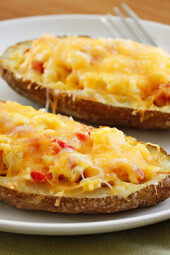 To make the potatoes dairy free what would you use instead of the sour cream? Thanks!! You could use Earth Balance or another non dairy butter substitute. It would obviously change the nutrition info. Another idea would be a plain non dairy Greek yogurt. I hope this helps! I was just thinking about this. Maybe a tofu based sour cream? I once saw a recipe for mashed potatoes that instead of cream or butter had olive oil and a little nutmeg. It ended up tasting very good. It’s obviously not low fat (or calorie, for that matter) so you’d have to adjust the calories/points. Depending on your reasons for avoiding dairy, goat cheese might be suitable. Dairy gives me trouble in that it hurts my stomach and my joints hurt the next day, but I don’t have that trouble with goat cheese products. Apparently the protein in it is different, or something. I buy the plain goat cheese tubes at Costco (they taste a little less “barn like”) and use it on a lot of things in place of sour cream. I also use it on salads. Great recipe. Highly recommend. My whole family loved t. My only question is when I put the nutritional info in the WW calculator it comes out as 7 freestyle points. Will be making again. Thanks for a great recipe! Loved it! I didn’t have Yukon potatoes so I used red potatoes. Recommended to friends and will make again. ? My husband loves this recipe! Do you need to thaw first if frozen? Thanks for all of the amazing recipes! Any specific reason for the yukon gold potatoes? I’m not a fan, they don’t taste right to me. Are they lower in calories or starch or something? Has anyone tried this with a half and half, potato and mashed cauliflower? Sorry, should have read other comments first. We’ve had shepherds pie before and liked it. I’ll try this variation this week! Thanks!! So delicious! This is one of our favorites! It is SO filling too. Hard to believe it’s only 5 points!